Allegedly on this date in 1724, a young woman was hanged at Edinburgh’s Grassmarket for concealing her pregnancy. Any number of details in this horrible/wonderful story are shaky, including the date: some sources make it 1728, a few say 1723, and only a handful attest a specific calendar date. Nobody seems to doubt the tale in the main, however — and it’s certainly excellent enough lore to deserve even a heavily asterisked entry. Deserted by her husband, young Maggie Dickson took lodgings at an inn in exchange for work, and became pregnant by either the innkeeper or his son. (Again — details in the various sources available read like a game of telephone.) Since single* pregnant working-class women had about as many employment options as birth control options, Maggie kept quiet about her condition in the interest of keeping her job. When the resulting infant turned up dead, the trail led straight to Dickson … but the concealment of the pregnancy and birth were capital crimes on their own, making it immaterial whether it had been a miscarried pregnancy, an act of infanticide, or simply one of the many early 18th century babies to die in the cradle. The law was an indiscriminate instrument to prevent women terminating their pregnancies. Nothing noteworthy about the hanging itself is recorded; it seems to have been one of the routine public stranglings of the age, and even the scuffle over the body between family and medical students hunting dissection-ready cadavers was a normal occurrence. And they all lived happily ever after. This day’s principal, at any rate, gained a foothold in adequate prosperity, bore more children, and answered to the nickname “Half-Hangit Maggie Dickson” all the many more years of her life. The story passed into legend; the dates, as we’ve alluded, fuzzed. One entrepreneurial English broadside publisher of the 19th century even transported the affair to February 1, 1813 — four years after a Concealment of Pregnancy Act reduced the penalty for Maggie Dickson’s “crime” to penal servitude. 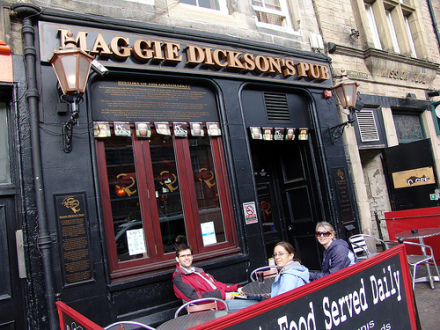 And near the site of the not-quite-Passion, should you call sometime in Edinburgh, you can raise Half-Hangit Maggie a pint at Maggie Dickson’s Pub. * Technically, she was still married but separated.